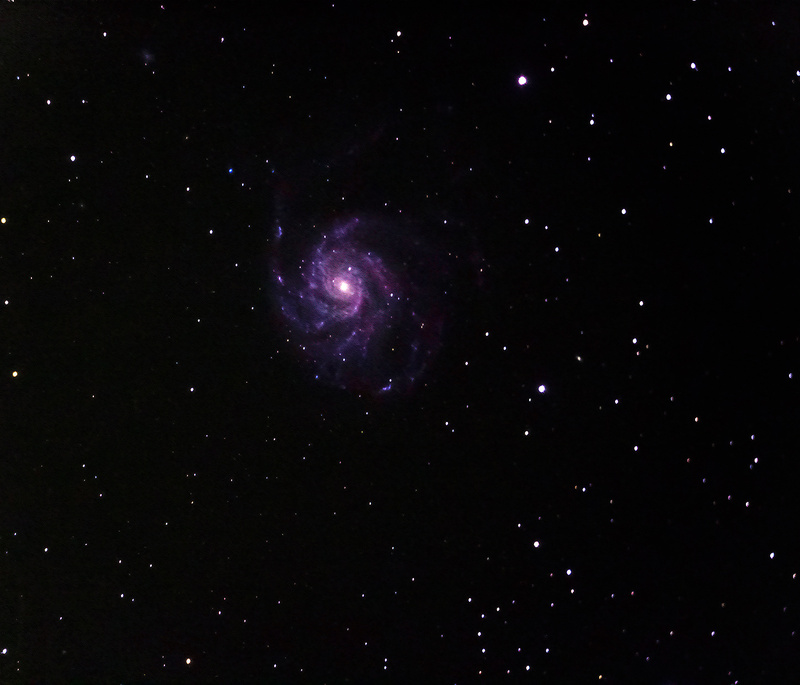 Here is another galaxy I imaged last week. This is the first time I have seen this object. The Whale and pup galaxies are located in the constellation Canes Venatici and are 25 million light years distant. The smaller galaxy NGC 4627, is a small elliptical,while the Whale NGC 4631 is a edge on spiral galaxy. NGC 4631 reminds me a lot of the Cigar galaxy located in Ursa major.a.k.a as Messier 82. Here is a image of Messier 97 a.k.a The Owl Nebula,located in Ursa Major. 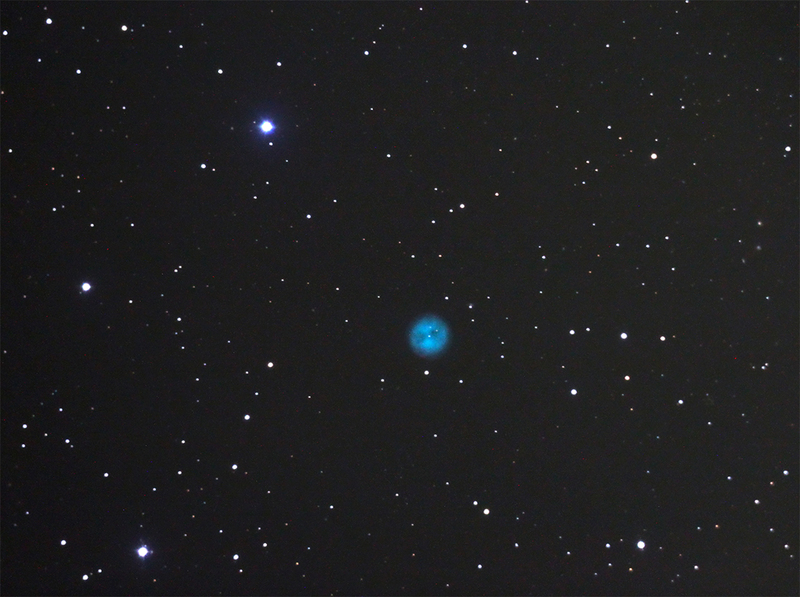 It is a planetary nebula caused by a star that shedding it’s layers as it slowly dies. Much like what our sun will be like in 5 billion years. 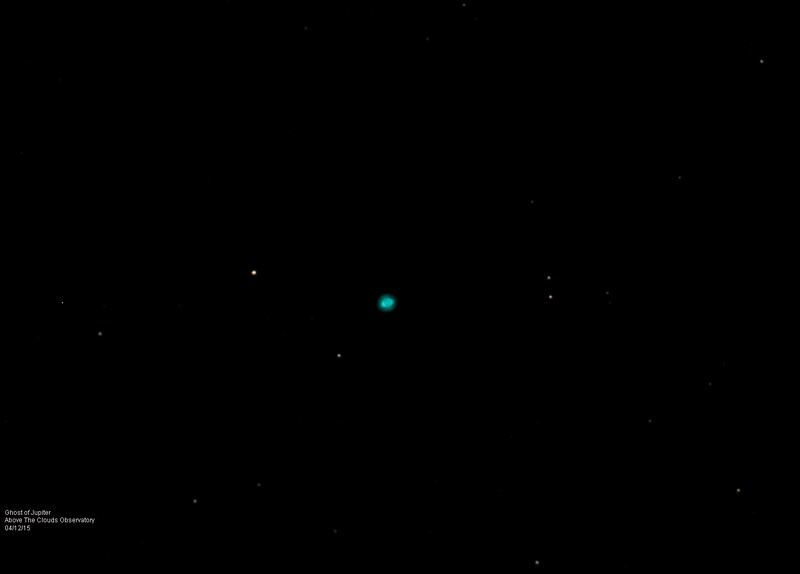 Ghost of Jupiter , NGC 3242. Located in the constellation Hydra. It is really small in the eye piece. It is only 1,400 light years away!. I suspect that when it was discovered,it resembled the planet Jupiter,due to it’s central star. It also looks like a eye in the sky. This galaxy is a fun target, and quite easy to see. The sky was quite crappy last night. I could see stars,but the transparency was pretty bad. The stars were twinkling,which is a bad sign,and shouldn’t bother imaging. 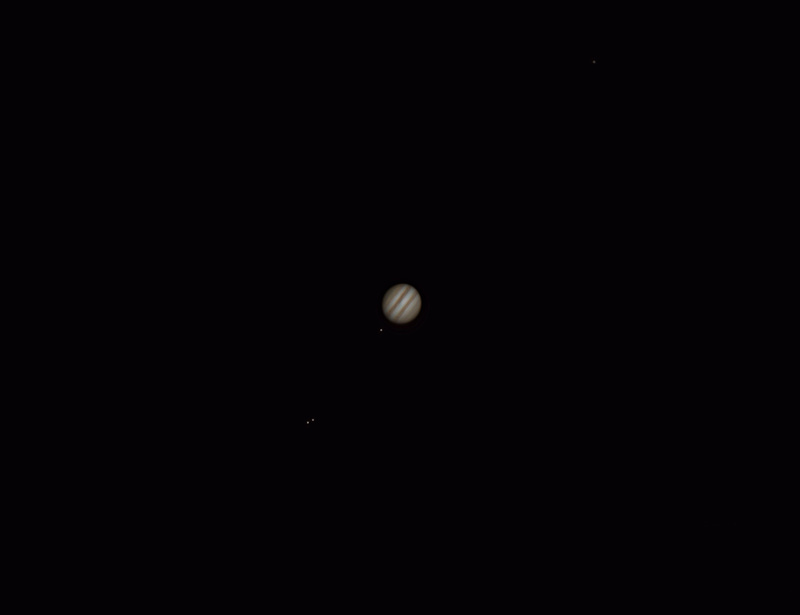 My first 2015 image of Jupiter shows it. I added the four moons in PS. Yes, that is exactly where they were located,but were very dim in the image. For those of you who don’t have a telescope,this is what you are missing! We had a small window of what I thought were decent skies. Actually, I had gone to bed,but looked through the window and saw clear skies. I couldn’t pass on it,and quickly raced out to the observatory. I did notice some of the stars twinkling,which is a bad sign. I spent a couple hours imaging as the seeing became worse. Lol,my images show it,as their isn’t as much detail as I would have liked. 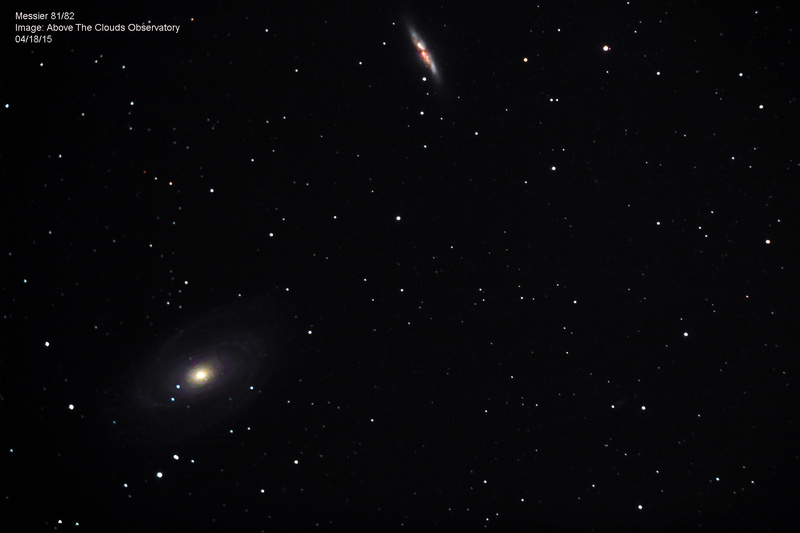 One of my targets was M81 and M82 together. This image is a 7 minute exposure unguided. 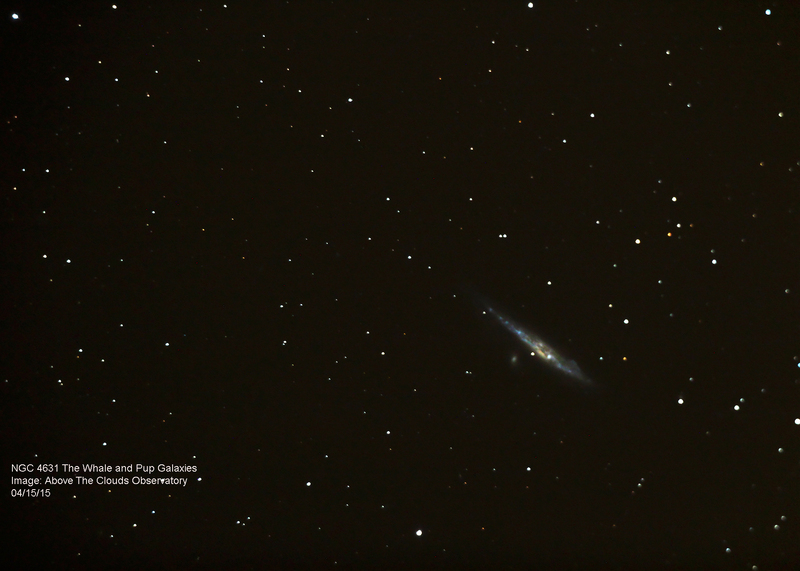 M82 (The Cigar Galaxy) really showed of it’s colors like I have ever imaged. 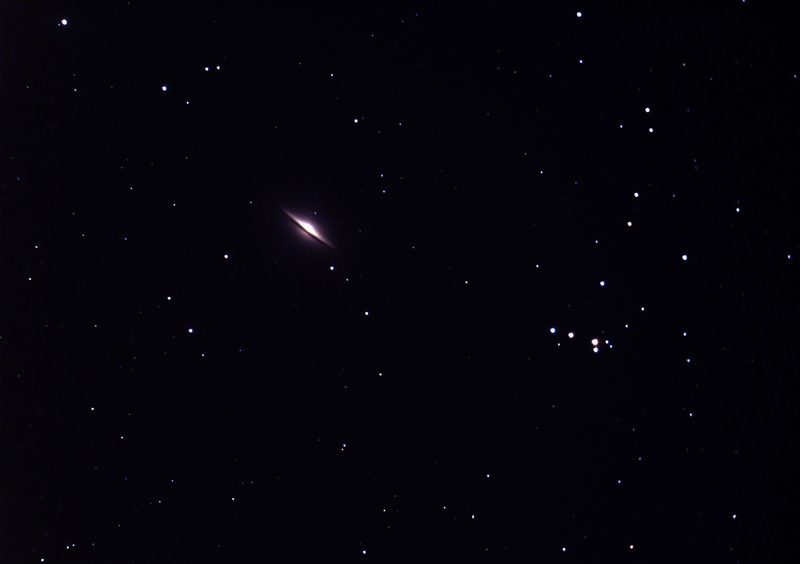 M 81 (Bode’s Galaxy) seems a bit muddled,but at least a Satellite didn’t photo bomb my image this time! 🙂 . I took this image about a week ago. The sky never ceases to amaze me. I have captured more galaxies in the last two weeks ,than I ever have since I bought my scope. At the rate my Winter was traveling,I didn’t think I would ever get a chance to observe again. However, the voices in my head kept saying “patience big fellow”. The time arrived ,and I am having a blast!. Cranking some music in the observatory and loving the fact that I no longer need to keep the wireless remote pointed at the DSLR while taking a image. Now, while I take a long exposure,I can just walk away,and ponder the thought of buying new rings and a dovetail for my other mount. Best of both worlds!. Let the main imaging scope do it’s thing,while I do some visual scanning of the heavens on my other scope. This is a 6 minute exposure unguided of Messier 101. Shot with a unmodded Canon T3i. The seeing was pretty good for the most part. The Pinwheel galaxy was discovered by Pierre Méchain on March 27, 1781.The visual mag of this galaxy is +7.9 mag. under dark skies. It might be tougher to see in light polluted areas. The distance is 27 million light years away,as in,it took the light we see today 27 million years to reach our retinas. Actually, I like to Google search what the Earth was like 27 million years ago or whatever distance light left a particular object.